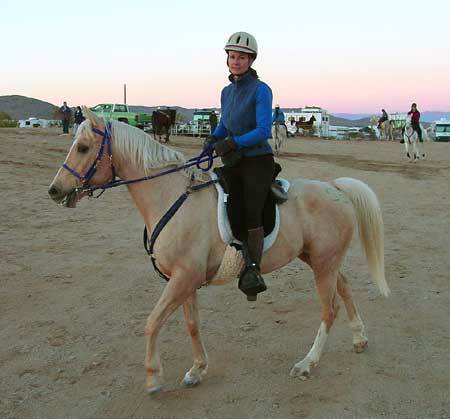 Meet Donna Blanchette and her trusty steed Paloma, seen here at an endurance ride in southern California. Paloma, born in 1996, is an Arab/Quarter cross, Palomino. While Paloma is small in stature she's really big at heart and loves to tear up the rocky trails around her home town in Western Arizona, barefoot of course! We affectionately call her "Donna's Ninja motorcycle". Color Country Endurance Ride, 2002, 25 miles, 8th place. Man Vs. Horse, 2002, 25 miles, 6th place. Coso Junction Jam, 2002, 30 miles, 4th place. 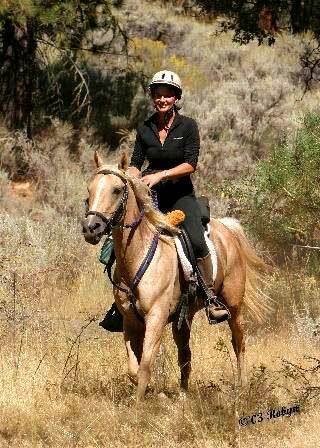 Color Country Endurance Ride, 2003, 25 miles, 4th place. Coso Junction Jam, 2003, 30 miles, 3rd place. Bear Valley Springs, 2003, 30 miles, 9th place.